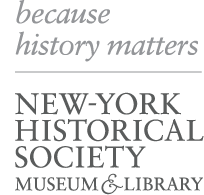 The New-York Historical Society proudly partners with colleges and universities around the city to create innovative courses that utilize our world-renowned museum and library collections. NYC’s Gilded Ages is a digital exhibit that was created by students in the Barnard College course, New York City’s Gilded Ages: Coming of Age, Past and Present, during the fall 2015 semester. The class and virtual exhibit were made possible by cooperation with the New-York Historical Society and with funding provided by The Andrew W. Mellon Foundation. Students were advised by Barnard professors and New-York Historical Society curators. New York City’s Gilded Ages: Coming of Age, Past and Present is part of Barnard’s educational initiative, Barnard Teaches: Real Place + Digital Access, which explores, integrates, and extends the concept of placed-based learning with new and emerging digital technologies.